The People in November 1965, pictured with Julie Grant. l-to-r: Ernie Graham, Eric Wrixon, Mike Niblett, (Julie Grant), George O'Hara and Davy Lutton. The People backed Julie during this tour. Belfast beat/soul group who developed out of an earlier beat group called The Telstars (1964-65). Graham, O'Hara and Lutton has all been Telstars. Guitarist Tiger Taylor recalls briefly being a member of The People during the initial period 1965, leaving shortly after the arrival of Mike Niblett on bass, who joined in late 1965. Eric Wrixon played keyboards. 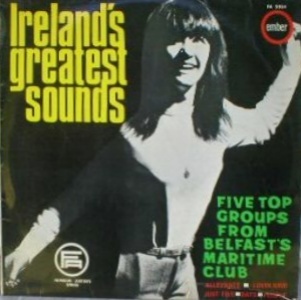 This is the lineup that made the bands only recordings which appeared on the Ireland's Greatest Sounds LP released on Ember Records in February 1966. Ernie Graham sang lead vocal on "I'm With You" and George O'Hara on "Well All Right"
In 1966 The People moved to Blackpool, following in the footsteps of The Wheels, who'd gained a huge local following there. 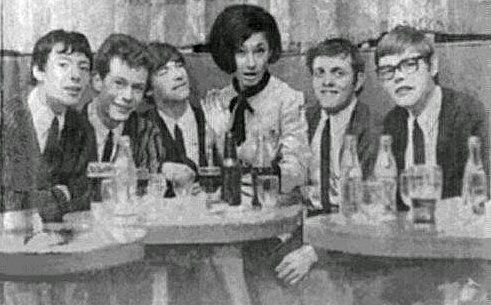 Eric Wrixon left to join The Wheels during the Blackpool period, appearing on the latters "Kicks" single released in 1966. He was not replaced and the band contined as a quartet. George O'Hara left in 1966 and was replaced by Henry McCullough, late of Gene & The Gents. McCullough suggested the band move to Dublin where he'd heard they could do much better financially than the tough living they were eeking out in Blackpool. 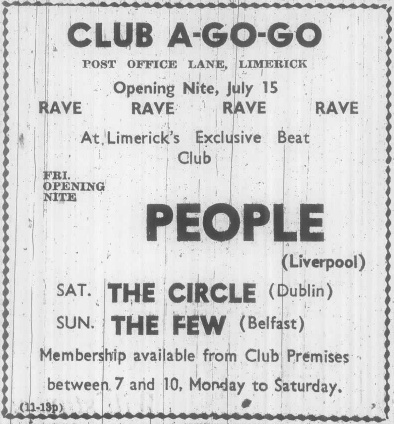 Opening the Club A Go Go in Limerick in July 1966. The People had a huge impact on the Dublin beat scene. Their manager during this period was Dave Robinson, later head of Stiff Records. Mike Niblett left at the end of 1966 and was replaced by Chrissie Stewart, ex Telstars. This lineup left for London in May 1967 and were renamed Eire Apparent by new manager Chas Chandler. George O'Hara returned to the College Boys (1975-77) and was later in Light (1977-80). Mike Niblett was in many other bands including The Stellas; Eric Wrixon had been a founding member of Them and was later in The Trixons, the fledgling Thin Lizzy and the late 1970s reformed version of Them. Tiger Taylor joined Teddie & The Tigers and would later join Eire Apparent, of course.